In some of my website listings, I've been comparing the color of the item to "outside my window, right now." I thought maybe I should give a quick example. 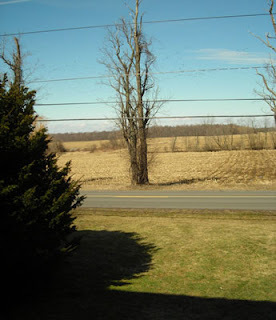 When I am taking photos of the clothes on my front porch, when I turn around, this is what I see (on a good, sunny day). I've listed a bunch of Flax that has that same yarn-dyed brown/green mix.